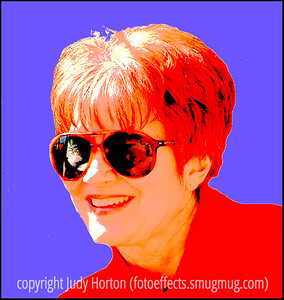 This gallery contains information about Judy Horton, the creator of these photos. If you would like to contact me about any of the images or inquire about my services, my e-mail address is hortonjudy@yahoo.com. If you want to purchase any images in the galleries, the printing is done by a professional print shop and this is all handled by Smugmug, which guarantees your satisfaction with the print. If you are not satisfied, you can simply return it for a refund. For printing of any of the panoramas, please contact me via e-mail and I can arrange to have them printed for you. I have printed some of my panoramas in sizes as large as 15" x 64". They can be very spectacular! All of my images are captured in RAW format with either a Nikon D800 or a Nikon D300 digital camera. As a result, they are very large image files and most are suitable for printing in quite large sizes. If you have questions about whether a particular image would be suitable to print in a large format, send me an e-mail and I'll respond to you personally. I have been interested in photography for many years but have only begun working as a professional photographer in the past seven years. I am constantly striving to improve my images and enjoy everything about the process of creating a photo. Sometimes I think I would like to specialize in a particular type of photography, but I am simply too interested in shooting all sorts of subjects to limit myself to a specialty. Like many other photographers here on SmugMug, I never go anywhere without all of my cameras, lenses and tripods. My family believes I am a Photoshop junkie, as I've spent thousands of hours developing my skills with Photoshop and associated plugin software. In addition to selling prints of my images, I also offer a full range of photographic services, including weddings, portrait shoots, infant shoots, high school senior photoshoots and composites, event photography, model shoots, boudoir shoots, and more. I'll also create custom party invitations or cards for you. I live and work in Colorado Springs and will be happy to customize a service to meet your particular needs.